Attractive new holiday house with a breathtaking view at the sea and a private pool. 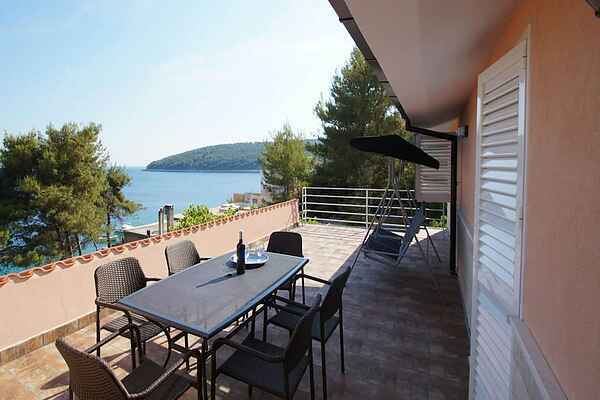 Located just a few steps from the sea on the island of Korcula, 9 km away from Vela Luka. This relaxing place is surrounded with greenery. Mediteranean fruits with beautiful panoramic view to the sea from your terrace. This house is decorated in a way combining this traditional style with modern facilities. In the garden around the house (40 m2) you will find in addition to the pool a terrace with barbecue. The outdoor area is a wonderful place for a bite to eat or a drink. And again you will be able to enjoy the stunning views. A perfect, safe and modern place for families or a group of up to 6 persons - 3 bedrooms including en suite bathroom. This spacious place is air-conditioned, a total living area of 100 m2, all on the ground floor and 50 m2 of private terraces around the house. This villa is situated in a unique, peaceful and quiet place on the island, just a few steps from the sea surrounded by pine trees, palms and figs. When it comes to food you are in the right place. In the direct vicinity great wine and olive oil are produced so you can taste and buy it directly from the producers. During your stay, you should really explore the island of Korcula, see the medieval Dubrovnik, where you can explore the Old town, Stradun placa and world famous galleries and museums. Home owner lives near the house, so can be there for any help if guests wants. If you bring your pet with you, please announce it to the home owner before arrival. Smoking is allowed on the outdoor area around the house, where you can rest and enjoy.